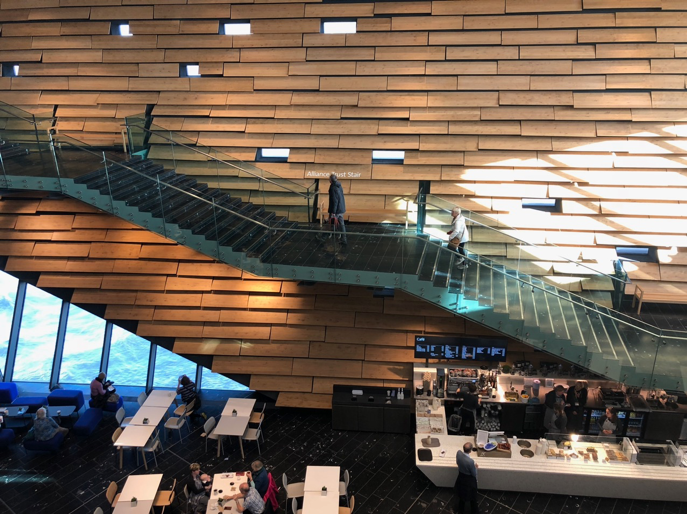 On our recent trip to Scotland, we took a detour to Dundee to visit the brand new V & A Museum. Coming over the Tay Bridge, the museum building looked to me like an enormous battleship. Maybe it was the masts of the tall ship, Discovery, behind it. The Discovery is moored next to the museum as a permanent exhibit. It returned from the Antarctic in 1904. Its Captain, Robert Falcon Scott, did not fare so well after his return. You can read more about “Scott of the Antarctic” here and more about the Discovery here. We were later told that the architectural inspiration for the museum was not a battleship, but was the nearby cliffs. This is a great article about the museum’s design inspiration with beautiful photographs of the exterior and interior. The museum just opened in September and we were lucky enough to arrive on a day where the crowds did not wrap around the building. Inside the museum, the architecture was just as dramatic. The museum is a tribute to Scottish design both historical and current. This exhibit ties Scottish crafts in with the modern age, demonstrating artists’ reinterpreting old arts. I loved how it made craft so relevant. 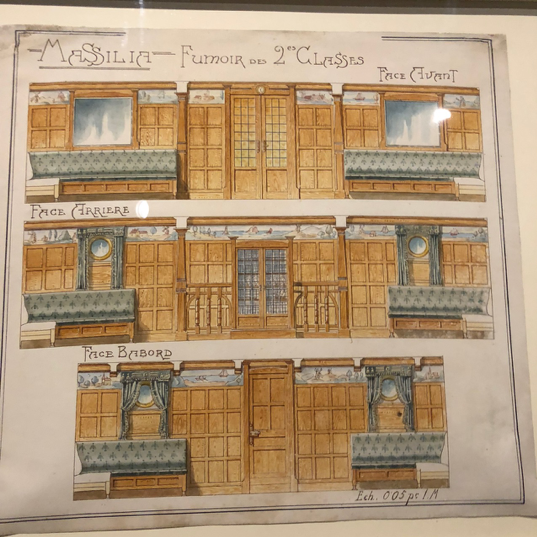 The exhibit on Scottish design was dominated by a display which looked like an enormous cabinet of curiosities. This is interesting in itself as this Victorian trend started in the U. K.
I loved the graphic nature of this display. The museum will also host a number of temporary exhibits. When we were there the first of these was focused on ocean liners. This makes sense once you understand Scotland’s long history of shipbuilding. Dundee itself was only one of a number of Scottish shipbuilding ports (the Discovery was built here). 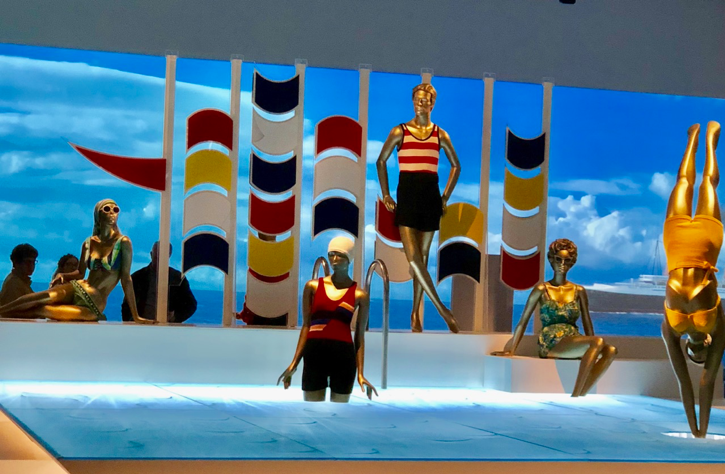 The hey day of the ocean liner as luxury travel was in the Art Deco/Art Nouveau period and this is highlighted in the exhibition. I absolutely love this design period, even to the point of having my business logo in a font reminiscent of this period. …To the gorgeous suitcases---no need to unpack! 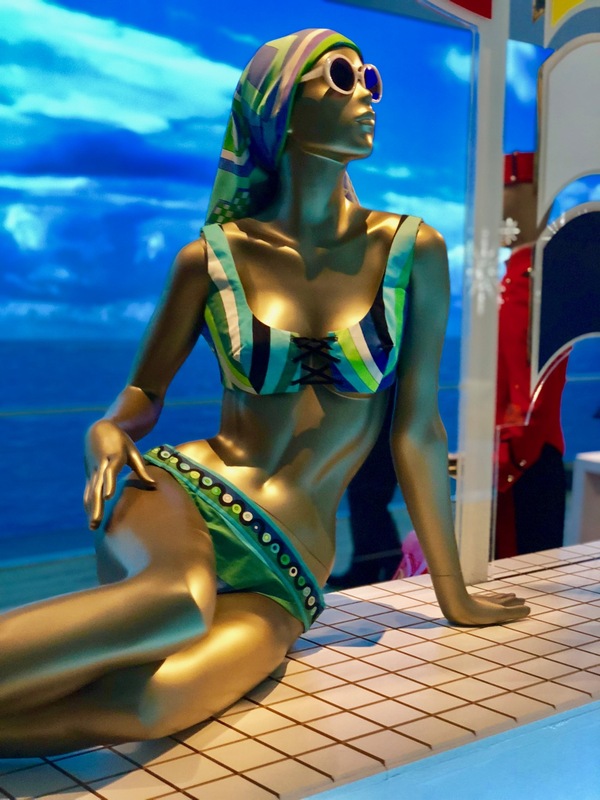 This great display really made you feel like you were on the pool deck! I love the Pucci bikini. Apparently, the Queen Mary is one of the last of the great ocean liners still intact and she is permanently anchored in Long Beach, California---a long way from her Scottish builders! If you are ever near Dundee, Scotland I highly recommend staying here and visiting the museum and town.